I love giving thanks to the Faeries. Over the years, as my relationship with the Faeries has grown and developed, I have learned a few important things, and one of the things that I have learned is that the Faeries absolutely love getting prezzies. That’s right! The Faeries really, truly love receiving gifts. I remember one time reading somewhere that if you ever thanked a faerie they would never help you again. I’ve read a few times that that faeries take presents and gifts as an insult or a sign to go away. This is absolutely and completely untrue. They really love and appreciate all of our gratitude and thanks. In fact, when we show our gratitude and thanks for all of their help and assistance, this really helps deepen our relationship with them. When we give thanks, it strengthens our love and friendship with the Faeries, it also shows the Universe that we are able to receive our abundance and gifts – that the Faeries assist us in manifesting – with grace and open hearts. This allows us to be open to receive even more love and abundance. I keep an area in my bedroom where I consider to be my place to leave offerings to the Faeries. It’s the top level a bookcase that I have decorated with velvet. I keep lots of rocks, feathers, crystals and other treasures that I find in this place. I like to share my treasures with the faeries. I also like to leave them little food offerings that I know they just absolutely love. When I open a fresh bottle of cream, I pour out the top part into a little dish for the Faeries. If I open a new package of butter, I cut a few small pieces off for them. I always make sure they get the freshest part of dairy, because they just absolutely love it. Same thing if I open a new jar of honey, I always give them the first few spoonfuls. Sometimes I like to make them a pot of tea, with fresh cream and sugar, and I pour them out a cup in my finest china. 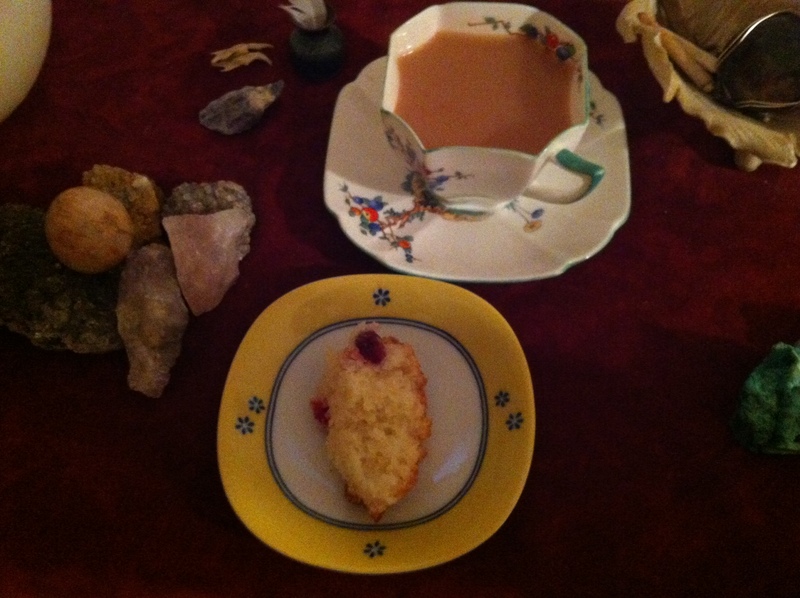 Today, I gave them the first cup of tea from a pot I made and then I gave them a piece of my cake. These little gestures really mean a lot to them, and they go a really long way. If you want to develop a strong relationship with the Faeries, I highly recommend creating a small space for them in your home and leaving them offerings. I would be very surprised if you didn’t have something magical and pleasant happen for you. A small note of etiquette – it’s not super important, but I find that it’s best to just compost or bury the offerings after a couple of days of sitting out. Not just for health purposes, but there really is no more energy left in the food after it has been offered. The Faeries take all the blessings from the food and return it to Source. There really is no right or wrong thing to offer to the Faeries. It’s whatever you feel guided to give to them. Trust your heart and go with the flow. Do what you want, when you want. They love any gift, sincerely. My experience is that they particularly love fresh butter and cream. Whenever I open a new butter or cream I offer them some. They also love alcohol, haha. Whatever tickles your fancy though. Having said that, I don’t offer them fresh flowers or fruits and vegetables because they seem like things they have an abundance of, haha. If you Google and search out the reason why it’s impolite, and strongly discouraged, to actually SAY “thank you”, you will understand better. The Faeries are not human. Their culture is not human culture, of any type. To say “thank you” to Them insults Them, because it puts Them in your debt. They don’t like that. Also, “thank you” is a word used so much in our human culture that it ceases to have meaning anymore. The Fae prefer actions and offerings, which is good that you give that.